The emblem of the southern hemisphere sky is here on the left: the Southern Cross, or Crux. But how many other crosses can you find in this field? At the right is a larger version of Crux, made of two stars from Carina and two stars from Vela. So it’s not a proper constellation but an asterism well known in the southern hemisphere sky, called the False Cross. You might also be able to pick out a third cross at lower centre, looking upside down but also made of four stars in an elongated diamond shape. The prominent centre-stage object here is the massive Eta Carinae Nebula, sometimes just called the Carina Nebula (I’ve never determined what the proper and official name of it is). Surrounding it is an array of star clusters that make this area an absolute delight to explore with binoculars. But this week, at our stay at the Atacama Lodge, our small observing party has had fabulous views of the nebula in a big 18-inch telescope that reveals intricate structure in the swirls and eddies of its glowing clouds. This is a stack of 6 exposures, each 3 minutes at f/4 with a 50mm Sigma lens and the Canon 5D MkII camera. Everyone from the north who sees this area of sky for the first time quickly realizes just how much better the sky is down south. This is the most spectacular region of the deep-south Milky Way, as it passes through the constellations of Carina, Crux and Centaurus. Dead centre here is the symbol of the southern sky, the Southern Cross. 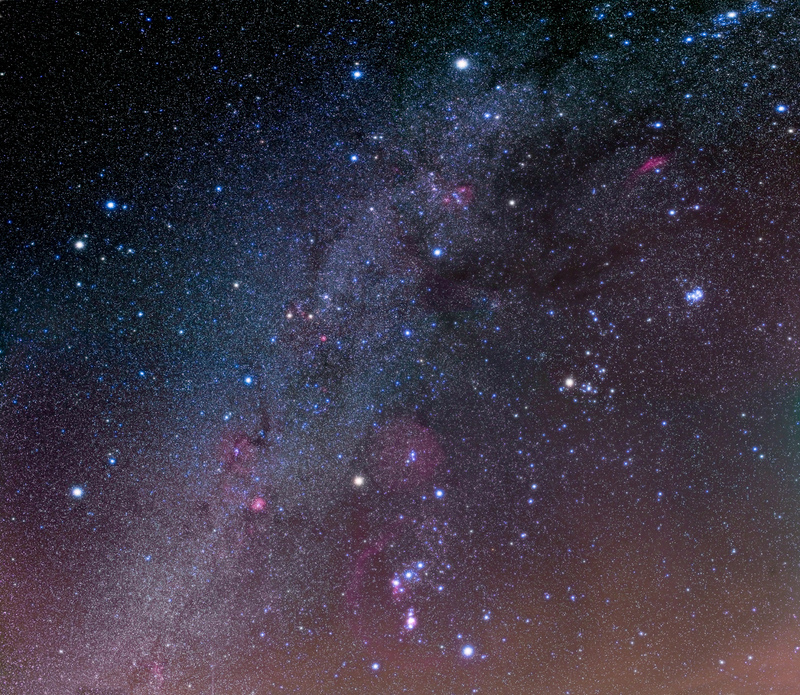 To the right of it glow the reddish nebulas of Carina and Centaurus; to the left of the Cross lie the dark clouds of the Coal Sack and the pair of brilliant stars, Alpha (on the left) and Beta Centauri. Alpha is the closest bright star to our solar system. This one field contains much of what makes the southern sky so memorable and a mecca for any backyard astronomer. 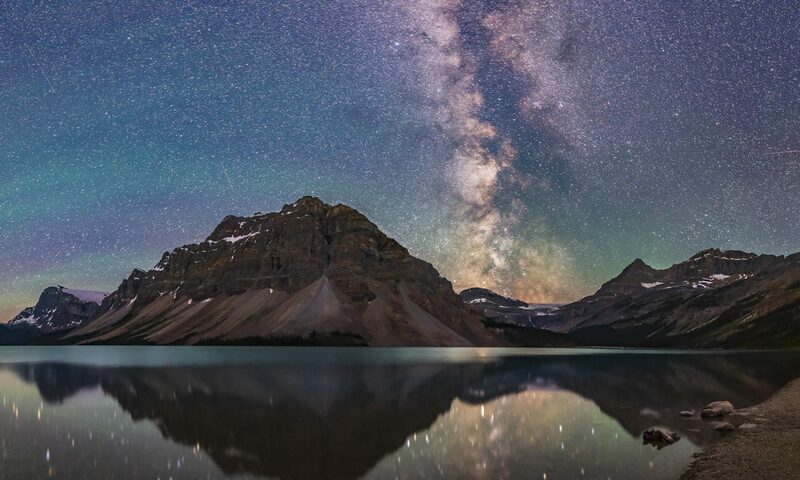 You haven’t lived an astronomical life until you’ve seen this part of the Milky Way, accessible only from southern latitudes. I took this shot last night, May 4, 2011, using a Sigma 50mm lens and a modified Canon 5D MkII camera. The image is a stack of four 6-minute exposures at f/4 and ISO 800, plus a stack of two more 6-minute exposures taken through a soft-focus filter, with those images layered into the final Photoshop image to add the star glows and make the constellation outlines, like the Southern Cross, pop out. This is without a doubt the most spectacular area of sky. 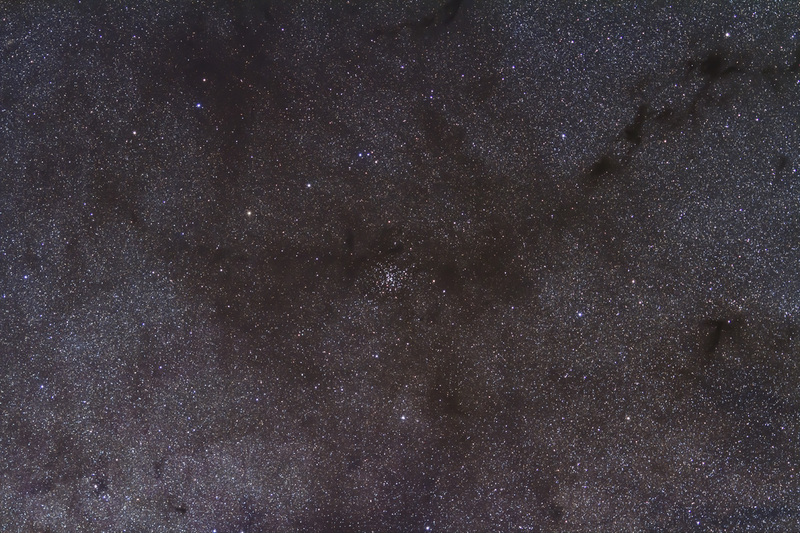 Here we’re looking toward the centre of our Galaxy, toward the starfields of Scorpius (at right) and Sagittarius (bottom centre). The field is a riot of stars, dark lanes of dust, and patches of glowing red nebulas. It is wonderful experience – wonder-filled! – just to lie back and scan these constellations with binoculars or a wide-field telescope. One outstanding feature are the parallel bands of dark dust that seem to form the shape of a dark prancing horse in the Milky Way. 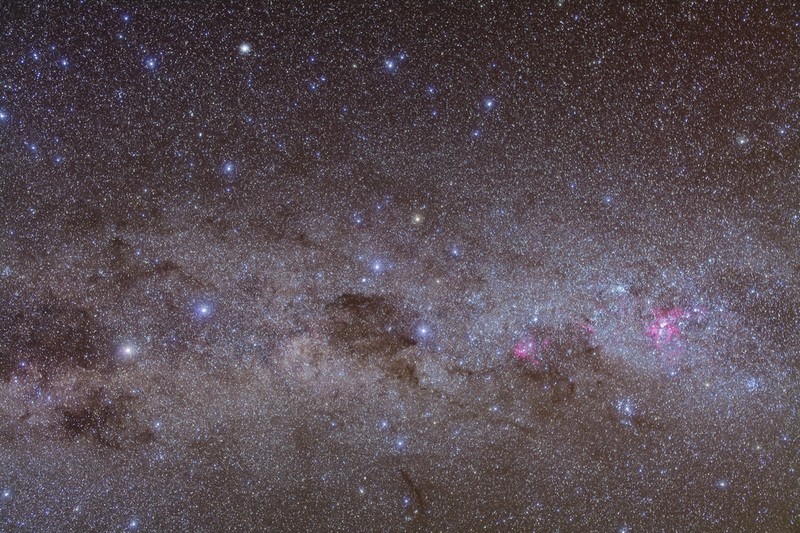 The brightest area of the Milky Way here is the Sagittarius Starcloud, and marks the direction of the centre of our Galaxy. From here in Chile where I took this shot, this region of sky passes directly overhead, making it more prominent than at northern latitudes where the galactic core is often lost in horizon haze. This image is a stack of four 6-minute exposures at f/4 with the 35mm lens and Canon 5D MkII camera. For one of the exposures I shot through a special soft-focus filter to add the fuzzy star glows that make it easier to see the outline of the constellations. The filter also emphasizes the colours of the stars. 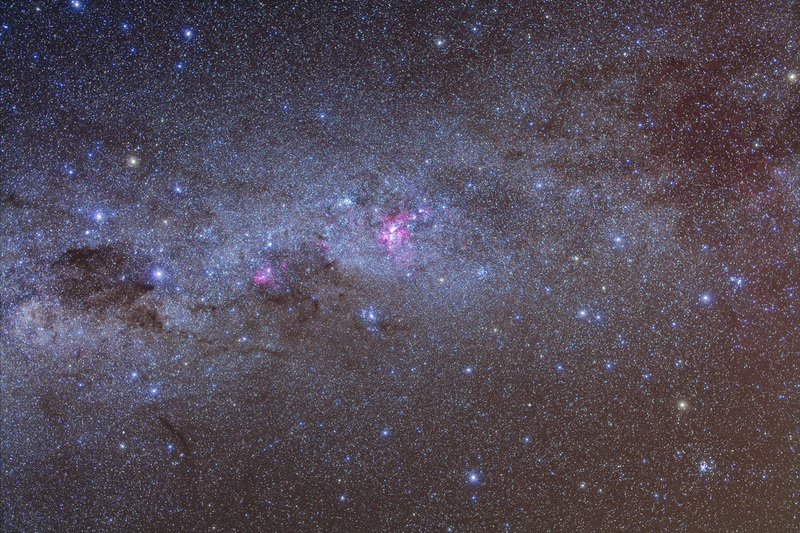 The image is a segment of a 12-section panorama I shot all along the Milky Way from dusk to dawn. I’ve shot lots of stuff along the Milky Way on my various trips to the southern hemisphere, but this field was a pleasant new surprise. While I had photographed this star cluster before, previous portraits had been extreme closeups. I had not shot it with a wide field like this. The field here takes in about the same area of sky as binoculars. One of my projects on this current trip to Chile has been to shoot binocular fields like this. And it’s a good one. The cluster is a little off the beaten track in Scorpius and tends to be ignored. But its position entangled with lanes of dark nebulosity makes it a wonderful contrast of stars and darkness. The dark lanes are obscuring dust in the foreground, hiding the light of distant stars in the Milky Way. The cluster itself is about 18,000 light years away, quite a distance for a star cluster, and putting it a good portion of the way toward the centre of the Galaxy. For this shot I used the Canon 7D camera and 135mm telephoto, for a stack of six 2-minute exposures at ISO 800 and f/2.8. 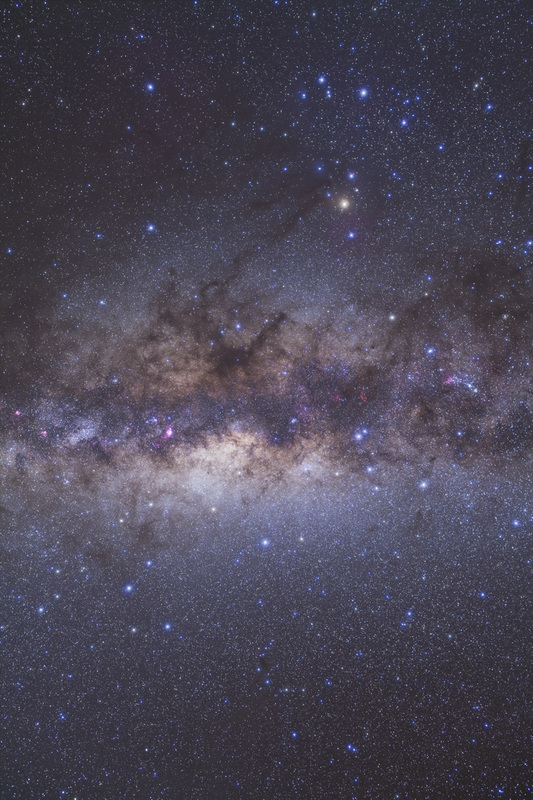 In the southern hemisphere sky we are treated to the stunning sight of the centre of the Galaxy rising each night, as the starfields of Scorpius and Sagittarius come up over the eastern horizon. 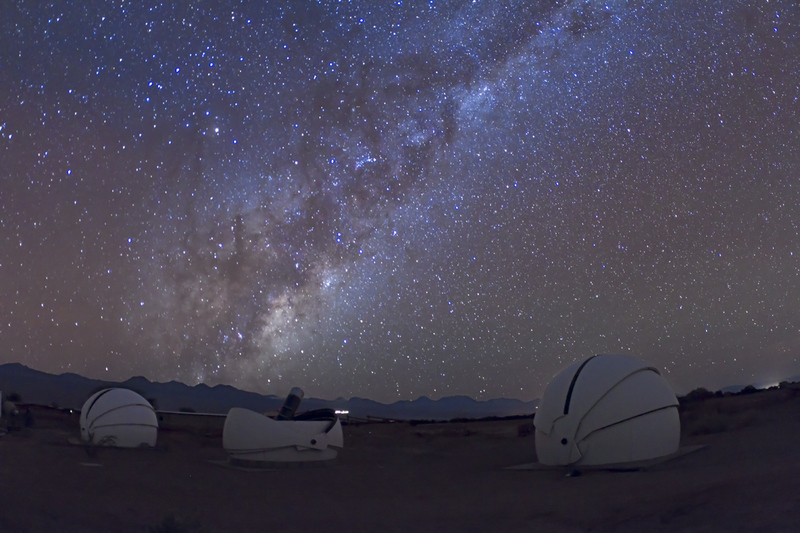 In this shot, taken last night (May 2/3), we see the Milky Way’s heart rising behind some of the robotic, remotely-controlled domes and telescopes at the Atacama Lodge in Chile. Only the centre dome is operating, taking images or data under the command of someone half a world away. 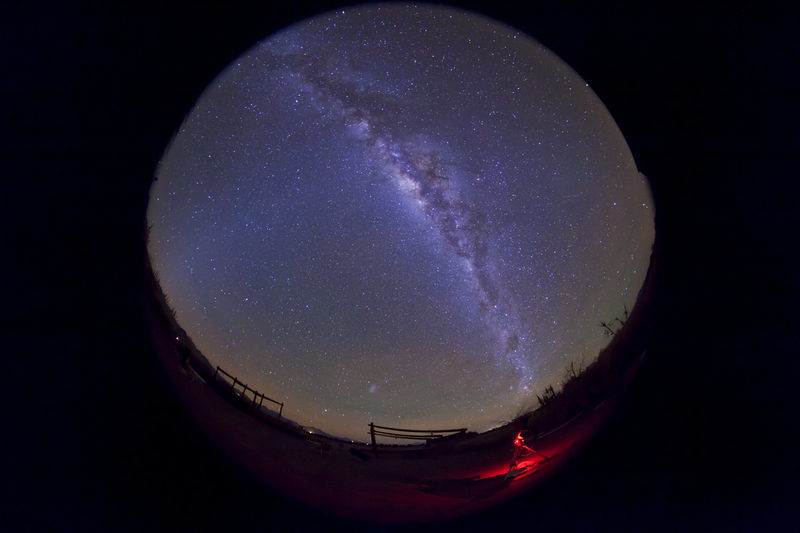 Amazing technology to be sure, but … that robotic observer misses the experience of standing under the Milky Way, watching its heart rise over the Andes and swing overhead through the night. The Milky Way is so bright it lights the ground, as you can see here. Last night our little group of 7 Canadian observers had a fantastic time exploring the southern sky with several telescopes, including an 18-inch reflector set up for us by lodge owner Alain Maury. With the help of a couple of wide-angle eyepieces we saw wonderful views of the Vela Supernova Remnant, dark nebulas in the Milky Way, and showpiece targets like Omega Centauri and the Tarantula Nebula – the list goes on! And will again tonight, as we compile another “hit-list” of targets to find tonight. This was the Milky Way as it appeared toward the end of a long night of non-stop shooting from Chile. The centre of the Galaxy lies directly overhead and the Milky Way stretches from horizon to horizon. This is one of the sky’s greatest sights, and this is an ideal time of year to see it. But only if you are in the magic latitude zone of 20° to 30° south. In this shot, another skyglow stretches up from the eastern horizon at left – that’s the Zodiacal Light, so obvious from this latitude. It’s sunlight reflected off comet dust in the inner solar system, and heralds the coming dawn twilight. My tracking platform – the device that allows a camera to follow the sky for a time exposure – is at lower right, with a second camera taking telephoto lens shots of star clusters in the Milky Way. I took this shot with the Sigma 8mm fish-eye lens and the Canon 5D MkII camera that was on a fixed tripod – it was not tracking the sky. But the 45-second exposure at ISO 3200 was enough to bring out the Milky Way in all its glory. This frame is one of 660 or so that make up (or will once I assemble it) a time-lapse movie of the Milky Way turning about the pole and rising through the night. The fish-eye format makes it suitable for projection in a planetarium dome. While I took this image a year ago in early 2010, I thought I’d post this up now, with the new blog now underway. This is a mosaic of what surely ranks as one of the most amazing areas of sky — the vast panorama of the night sky visible in the northern hemisphere each winter. Here we see more bright stars than at any other season of the year, in the constellations (in clockwise order) of Orion, Canis Minor, Gemini, Auriga, and Taurus. Canis Major and its luminary, Sirius, are just off the bottom of the frame. This is a 4-panel mosaic, each panel consisting of four 4-minute exposures plus two 4-minute exposures with a soft diffuser filter to add the star glows. Each was taken at ISO 800 with the Canon 5D MkII and a 35mm lens at f/4. Slight haze, changing sky fog, and changing elevation of the fields make it tough to get consistent colours across the sky during the couple of hours of exposure time needed to grab the images for such a mosaic, especially from my home latitude. But this attempt worked pretty well and records the wealth of bright red and dark nebulosity throughout this area of sky, a region of the Milky Way in our spiral arm but a little farther out from the centre of the Galaxy than where we live.